We present to you our video of our 20th anniversary teaching Spanish in Bilbao. It is a fun video and it sums up the fun moments that we have together. It is a video of gratitude to the students and friends that have accompanied us in the past 20 years teaching Spanish in Bilbao. We want to invite all the friends that have accompanied us in these years teaching Spanish in Bilbao. 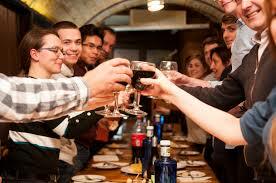 Especially, to the students that have accompanied us in these years teaching Spanish in Bilbao. Especially to the students of the Spanish courses for foreigners and all those who have done the Spanish teacher course and have trusted Instituto Hemingway to learn Spanish. Also we want to invite the families that collaborate with us and, with so much care, accommodate the students in their houses and that make them feel like another member of the family. And of course we want to mention all the teachers who give their most everyday, to be able to teach our language and culture. These 20 years have been a lot for those students that have passed through our classrooms. Many students come from countries close from Europe and others from the corners more unsuspected of the planet. Some of them have accompanied us only a few days and others for many months. We want to thank all of them for the confidence put in us.